Ever since he came to prominence prowling the sidelines of NFL teams as a coach for the New England Patriots, Cleveland Browns, and Kansas City Chiefs, I have always wondered one thing about Romeo Crennel: is he related to Carl Crennel? When I started watching CFL football, I had this brief affinity for the Edmonton Eskimos who were always winning the Grey Cup. The first couple years I watched, the Eskimos faced the Montreal Allouettes, who seemed to perpetually represent the East. One of the defenders that seemed to terrorize the Eskimos was linebacker Carl Crennel, who always seemed to be around the ball. However, he just couldn’t do enough, and the Eskimos won the championship. 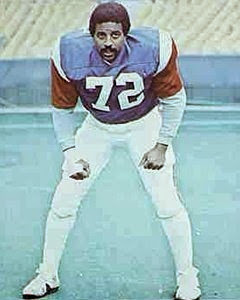 Then, late in the 1979 season, I heard on the news the Eskimos had acquired Carl Crennel. That was so cool, because I still liked the Esks and I liked Crennel. Now they were combining forces. Besides, they already had a guy named Dave Fennell, and that rhymed with CrennelI. It was part of this odd name game I played with the Eskimos. They also had Warren Moon and David Boone, which rhymed, Mike Wilson and Tom Wilkinson, who sounded alike, and Dale Potter and Hector Pothier, which also sounded alike. I recall right after I heard the news about the Eskimos acquiring Crennel, they were playing late Saturday night. I fell asleep before I could watch the game. At school the following Monday, I asked around if anyone watched the game, and if Crennel played. No one either watched the game, or recalled seeing him play. He did end up playing with the Eskimos that year, and winning the Grey Cup. The next season, Carl Crennel became expendable and was traded to Hamilton, where the rebuilt Tiger-Cats went to the Grey Cup, but got blown out by – you guessed it – the Edmonton Eskimos. When I started watching the CFL, it coincided with the Saskatchewan Roughriders hiring former quarterbacking great Ron Lancaster as their head coach. The team was terrible, winning four games in two seasons (of a 16-game schedule mind you), in 1979 and 1980. This began their descent into oblivion, after years of being a contender. Then, in 1981 the Riders hired Joe Faragalli, an assistant with the Eskimos during their Grey Cup dynasty, and he began to rebuild the team. He acquired Joe Barnes to quarterback with John Hufnagel, and picked up Lyall Woznesensky and – Carl Crennel – to bolster his defence. By then, Crennel had become expendable in Hamilton too. Crennel and the Woz strengthened the defence, but the Riders were still not good enough to make the playoffs. They had a winning record at 9-7, but in the tough West Division finished fourth and one game out of the playoffs. Shortly after that, I lost track of Carl Crennel. I never thought of him again, until Romeo Crennel started winning Super Bowls with the Patriots as their defensive coordinator. I began to wonder if the two Crennels were related. After a bit of research, I discovered the CFL defender and the NFL coach were related. It turned out they are in fact brothers. It just shows you how small the football world is, just like any community. Carl was the first black player at EC Glass Hugh School in Lynchburg Va., not W Va. (I was there).